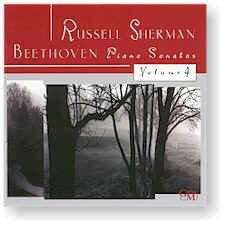 The fourth of five double-CD sets in which master pianist Russell Sherman records all of the Beethoven Piano Sonatas. His vision of the Sonatas is boldly expressive — the first three volumes (GM2050, GM2053, and GM2057) have received widespread critical acclaim, including Stereo Review's "Pick of the Month," five-star reviews, and numerous mentions on annual Top Ten lists. Recorded on April 14-17, 1997 (except for Sonata 11, Opus 22 recorded May 18, 1998) at the Church of the Redeemer, Chestnut Hill, Massachusetts.